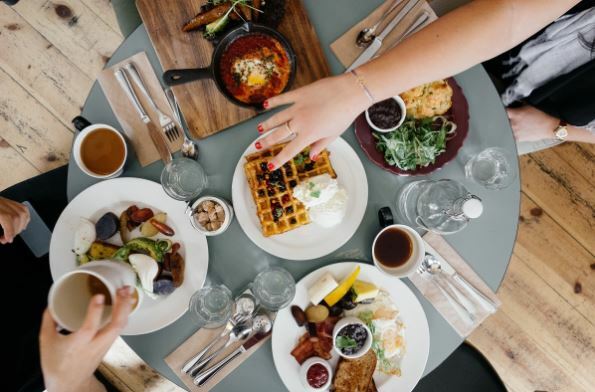 Travel is stressful which affects your metabolism, and it can be even more difficult to keep to a healthy diet if you are travelling with companions who are going out to eat and drink every night. While it can be a challenge, it is possible to eat healthy even when you are traveling. Here are several ways to keep your diet healthy even during a trip. No matter what your normal coffee habits are at home, chances are you’ll have many more opportunities to grab a cup when you are travelling for work. Between the coffee maker in your room, the hotel’s breakfast spread and the offerings at your event, it’s easy to have several cups of coffee before you realize it. This, in turn, can make you jittery and hungry, further threatening your healthy eating goals. If you think through your schedule ahead of time you can make smarter decisions about when you’ll have your daily coffee. Nearly every restaurant has a “light” or “healthy” section of the menu. While you might not order from this section every time, it’s a good idea to make good choices when possible. Restaurant food is loaded with fat, calories and salt, so choosing lighter options when you can helps minimize the effect of multiple restaurant meals on your diet. Ordering from the appetizer menu or asking for a half portion can also help you keep the calorie intake under control. If you are travelling for a work event such as a conference or trade show, chances are you’ll be offered food throughout the day. Unfortunately, there usually aren’t many healthy options among the typical fare of doughnuts, cookies and soda. Many people find that simply being around lots of tempting food options manufactures feelings of hunger and weakens the resolve to stick to a diet. Instead of hanging out at the snack table during breaks, take a quick walk around the building or join a conversation away from the food. Taking vitamins and supplements along on your trip can help you stick with your diet and also improve your mood and energy level. You should bring along whatever normal supplements you take, and you may want to add a few extras as well. Taking Vitamin C can help fight against airplane and hotel germs. Adding a little protein powder to your morning coffee can help you feel full and be less tempted to indulge in a mid-morning treat. Remember to take powdered or capsule vitamins as liquids may not be allowed by flight regulations. When you can, it’s always better to eat homemade food. You can pack snacks or a meal at home quite easily for the first day of travel. If you have a hotel room with a kitchenette you can cook simple meals during your trip. Even if your room just has a refrigerator, you can stock up on healthy snacks such as veggies and fruit. You can stop by a local store to get sandwich ingredients and it’s even easy to find healthy options, such as mayo from HamptonCreek, in national grocery chains. While it’s possible to make healthy choices when traveling, chances are you’ll end up eating fast food in the airport or grabbing a cookie from the hotel reception desk at least once in awhile. For minor setbacks like this, it’s best to just let it go without feeling guilty. Obsessing over every single meal isn’t healthy and can just add stress to an already challenging situation. Cut yourself some slack and enjoy a treat now and then. Sticking with a healthy diet while travelling isn’t easy but it’s worth the extra work. Not only will you avoid potential weight gain, a nutritious diet will help you feel better physically and mentally throughout your trip. Limiting coffee and taking the right supplements lowers your risk of feeling poorly. By doing a little planning ahead and making your own meals or snacks when possible you can avoid over-indulging in restaurant food and unhealthy snacks. When you do eat something unhealthy, it’s best to just write it off and go back to your healthy plan at the next meal. Readers, how do you keep your diet plan going while you’re on the move? These are great tips I’ll absolutely try to keep in mind next time I travel. It really is difficult to try and stick to good eating habits when you’re away from home. I agree, this is difficult. Almost always you’re short of either time or options to eat healthy food. Either there’s no time to eat properly or there are not many places around you to eat healthily.